Modular Seal Links and GP compression seals. Engineered solutions for leak sealing pipes through concrete walls. 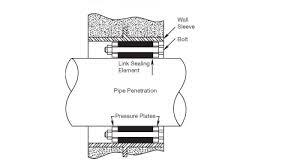 Pipe penetrations through foundation walls, Manholes, Wet Wells, Lift Stations, Valve Chambers, and Bulkheads. Pressure sealing for Water or Gas. Repair pipe leaks while the pipe remains in service. 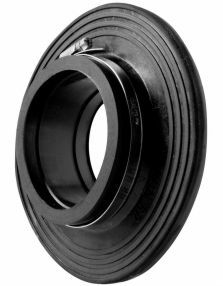 Seals for SDR pipe sizes, Ductile iron pipe sizes, Concrete, PVC, and Sewer pipes - low or high pressure sealing up to 72 psi of pressing water. 160 ft head. Corrosion resistance, 316 stainless steel nuts and bolts..
Seal elastomers: EDPM, for water, sewer pipes. Use NBR elestomer for petroleum applications and Silicone elastomers for high temperature requirements. Where Viton seals are required use a plug model seal . Pipe seal plugs with Viton elastomer are compression split plugs "viton compression seal models" for applications requiring a Viton Seal. Seal more than one pipe through the same core, watertight up to 36 psi of pressing water. Up to a 80 ft. of water head." D-LPS Models are Watertight up to 160 foot water head, see below. For pricing Contact Westatlantic Tech Corp., USA and Canada. Cast in sealing for pipes through concrete walls, floors, pools. Pipe sealing for Ice rink concrete slabs. Cast in the floor slab around a pipe, puddle flanges prevent radon gas penetration into a basement. Non-metallic wall sleeves: provide a engineered system for watertight pipe penetrations. WA.ZVR wall sleeves permanently bonds to the concrete and becomes an integrated part of the wall structure. The exterior has a special fused cementation coating for concrete-bounding. WA. ZVR sleeves maintain complete ovality during the concrete placement. A perfectly symmetrical entry point is formed for pipes and conduit passing through the structure. Cement bonding pipe sleeves are available from Westatlantic Tech Corp. The coating bonds perfectly to the wall sleeve, and adheres homogeneously with the concrete. ZVR sleeves may be set in , block walls, concrete walls or cast in a wall opening using mortar. WA. 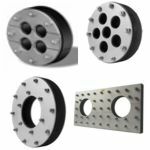 ZVR wall sleeves are watertight at pressures up to 72 psi (5 bar) – used in conjunction with modular seals, disk seals and press seals, they produce a completely watertight penetration for pipes, conduit or cables . Provides a 36 psi seal, 80 foot. head. Better seal integrity when higher head pressure is present. Corrosion resistance stainless steel hardware. Pipe seals for large or small annular spaces. Pipe seal sizing for all pipe diameters. 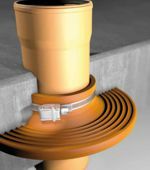 Compression Disk-pipe seals for pipe through concrete walls. Disk seal sizing is determined from calculations based on the number of pipes through an opening and location of the pipe penetrations within the opening. Hole size is the determining factor for the number of pipes that can be sealed with disk seals. Disk sealing is used wherever a link seal cannot be installed due to technical reasons e.g. 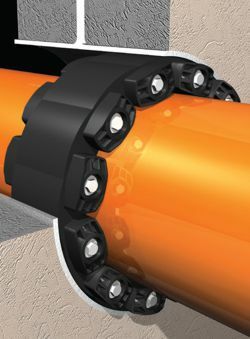 multiple pipes through the same opening, large annular spaces, holes or core holes too small for a seal and the pipe, higher pressure seals required, etc. DL Link Moduar Models: for 72 psi - 5 bar, tight up to 160 foot water head. DL high pressure link-modular element seals are also available for conditions where pressing water is greater than 36 psi. 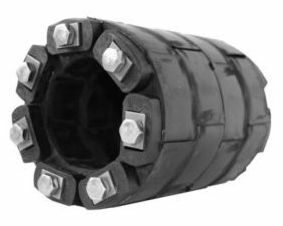 Double link interconnecting belts provide a hydronic seal to 5 bar (72 psi) 160 foot. head. modular seal links, repair, leaking. Leaking link seal repair, modular seals. Pipe not centered. Water proof pipe passing through concrete walls and floors. USA, Texas, TX, Florida, FL, Ohio, OH Oregon, OR, New York, NY. Canadian Regions and City availability; In Alberta, AB; Edmonton, Fort McMurray Calgary. British Colombia, BC; Kelowna, Vancouver, Prince Rupert, Kitimat. Saskatchewan, SK; Regina, Saskatoon, Prince Albert, Esrevan, Swift Current. Manitoba MB; Winnipeg, Thompson. Ontario, ON; Toronto, London, Ottawa, Hamilton, Quebec, QC; Montreal, Quebec City, Trois-Rieviers, Chebougamau, Sherbrooke. New Brunswick, NB, Nova Scotia, Newfoundland Labrador, NL, St John's, Goose bay, Long Harbour, Marystown.